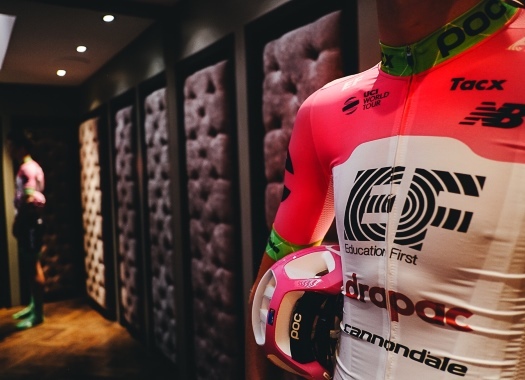 Canadian Michael Woods of EF Education First was the first rider from his country ever to finish on the podium of Liege-Bastogne-Liege on Sunday. The 31-year-old attacked along with Romain Bardet in the finale, with the eventual race winner Bob Jungels already well ahead, and ended up beating the Frenchman in a sprint of two in order to secure second place. The result comes after a spring in which the rider has struggled to find the right shape. "I struggled a lot at the start of the season with illness," he said. "I didn’t have the season start I wanted to. Today is the first day I actually felt like a bike racer again. I felt awesome throughout the day and had really great support from the guys." Woods added that an unfortunate food break may have allowed Jungels to attack and win the race. "I was a bit to blame for that," he explained. "I was right on his wheel, and I grabbed a gel when he went. He rode a strong and courageous race. I wouldn’t expect anything less from him. He’s a classy guy." Nevertheless, Woods did what he could to at least fight for the remaining podium spots, attacking along with Bardet while the remaining favorites looked at each other. "Bardet made an excellent move. I knew as soon as he went that it was the move to follow. I was able to get on his wheel, and we worked fairly well together up the climb." Woods truly presented himself to the larger cycling public in 2017, when he finished ninth at Liege-Bastogne-Liege and seventh at the Vuelta a España.